NEW YORK (CNNMoney) -- Want to go where the jobs are? Check out New York's tech industry. The city's second annual NYC Startup Job Fair, held Friday, drew a packed-to-capacity crowd of both job seekers and those looking to hire them. It was so jammed that the organizers turned away 80 startups looking to attend and recruit. "This is the only industry that has a booming number of jobs -- and they cannot fill those jobs fast enough," said Drew Nichols, development manager at career website TheLadders.com. With 400 employees, his company is looking to expand across all fronts. Nichols is especially eager to hire more software developers. "The market in New York is very tight," he said. SecondMarket business strategy analyst Alex Horn started the event last year to help grow the New York tech ecosystem. "There wasn't really an opportunity for students looking for jobs in the startup space," he said. And as venture capitalists pour money into startups and valuations soar, the hunt for employees has taken off. Karsten Vagner, recruitment manager at ZocDoc, a medical appointment scheduling startup, said they are "aggressively hiring." How aggressive? Think costumes, beer pong, and $100 cash on the spot. The ZocDoc crew dressed as doctors and nurses, enticed attendees with games of beer pong (ok, the cups were filled with water), and handed out a "resume" on the company -- while collecting nearly 300 resumes from job seekers. They also created a quiz for potential engineers, dishing out $100 cash and an interview invitation to those who passed along. "Next week, I expect us to make a dozen hires," Vagner said. But it's not just engineering positions that are opening up. "We're hiring in everything," said Nikki Laffel, who runs production at Quirky, a consumer products company. "We're scheduled to double in size this year." 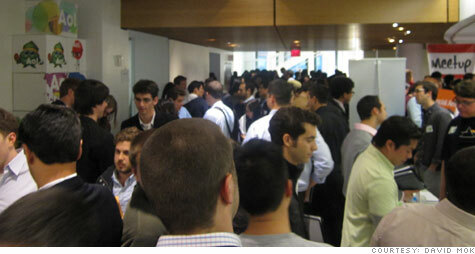 Held at AOL's (AOL) headquarters and co-hosted by the Columbia Venture Community and NYC Ventures, two university-based networking groups, the startup fair drew a steady stream of college students hoping to work at entrepreneurial companies. Anku Oberoi, a New Jersey Institute of Technology student who will graduate this year, came with a stack of resumes. "New York is like the finance capital of the world. I think it's time for another industry to take over," he said. "Tech seems to be that next industry." New York City Council Speaker Christine Quinn cast the startup boom as a sign of a recovering economy. "These start-ups are evidence that Silicon Alley is alive and well in our city, and that there is so much creativity and economic activity happening right now," she said. While there's talk of a recovering economy, there's also chatter -- and concern -- about an increasingly bubbly tech outlook. After all, this is how the hiring scene felt at the height of the dot-com mania, with startups devouring every skilled employee they could find. Then the bubble burst and the pink-slip parties started. But such dark thoughts had no place at Friday's packed gathering. Samantha Smith, a student at NYU, sees this as a prime time for entrepreneurship. "It's never been easier to start something," she said. And for graduating students eyeing the job market, working in a creative environment where blue jeans and hoodies are the standard office attire doesn't sound like a bad gig. "The culture of a startup is so much fun," Smith said. "It's more open." So what about the 80 startups that got turned away? "It took on a life of its own," said Dan Goikhman, co-founder of Mojiva, one of those turned away. "This will culminate in an event produced by startups, for startups and those looking to work with them." The organizers hope to hold their event within the next month or two. They're in talks with venues such as Terminal 5, one of New York's popular music spots. The goal, Goikhman said, is to "be fun, somewhat different, and hopefully not your average job fair."